Various parameters with the corresponding technical nomenclature are used to define the characteristics of a power supply. Although most testing methods have been standardised and adopted by most manufactures, there are still differences in the way they are implemented making direct parameter comparison sometimes impossible. For this reason it is often convenient to contact the manufacturer in order to get more details and eventually samples to test in your own environment. The following is aimed to help the customer to understand the specifications found in our catalogues. This is the temperature of the environment where the PSU is operated. This temperature increases with the heat generated by the components of the equipment. In order to increase the reliability and life of the system, it is important to keep it as low as possible. It refers to the voltage change of one output due to a load change on another. This problem affects mainly the semi-regulated secondary switching outputs. It represents the power derating, as %/°C, applied to the PSU when ambient temperature rises above a specific limit, typically 50°C. This technique is used to protect the system from possible damages caused by continued output short circuit conditions. In this case the short circuit current is kept less than the nominal value. In switching power supplies, the peak current at start-up due to the input capacitors charge is very high. A resistor (R1 in fig.) connected between the bridge rectifier and the capacitors is used to reduce it. Once the capacitors are charged, this resistor is not longer needed because it would reduce the PSU efficiency. There are different techniques used to overcome this problem, depending on PSU power rating. Low power applications employ NTC thermistors which show a high resistance when cold (start-up) thus limiting the inrush current. As its temperature increases, due to the current flow, its resistance decreases reducing the power dissipated. This method would not be effective when repetitive on/off operations are carried out in a short time, because the NTC would not have enough time to cool down. A second method, used in higher power applications, is based on a switching device (Triac or Relay) that shorts out the resistor (R1) after power-up. When active current limiting techniques are employed, there is a longer delay between power-up and the output voltage reaching of the rated value. The figure shows the input current of a switching PSU without power factor corrector. The peak current is about 5 times the RMS value. This must be considered when dimensioning the input switch and the fuses. Maximum current deliverable by every single output (the cumulated power of all the outputs may not exceed the total rated power). Cross outputs current configuration to allow no-load condition on secondary outputs. Minimum value of the current protection limit threshold. Maximum percentage change in output voltage with load held constant to Iout, as the input voltage is varied over its specified range. Variation of the output voltage due to a change in the output’s load within a specified range (10-100% Iout) with all the other factors held constant. It is the temperature range which guarantees a proper operation of the unit. This protection limits the output current and operates between 110% and 130% of the nominal value. It protects the unit from an excessive increase of internal temperature. It causes a reduction of the output power or the unit shutdown. This protection intervenes when the output voltage rises above 120÷130% of the nominal value, switching off the PSU which can be restarted by removing the input supply for a few seconds. The unit can deliver to the load a current level above the limit set for the steady state operation, only for a short time and with a given repetition rate. A reliable power supply is certainly essential to any equipment. Reliability predictions are based on the handbook MIL-HDBK-217 which contains failure rate models of various types of electronic components. This handbook is targeted to military application, therefore some companies choose a less severe prediction based on an alternative handbook specific for commercial electronic products. This method requires that each component has been tested long enough to determine its failure rate. Operating temperature is a dominant factor because it heavily affects the component’s life. The switching technique has the disadvantage of generating noise and disturbances. 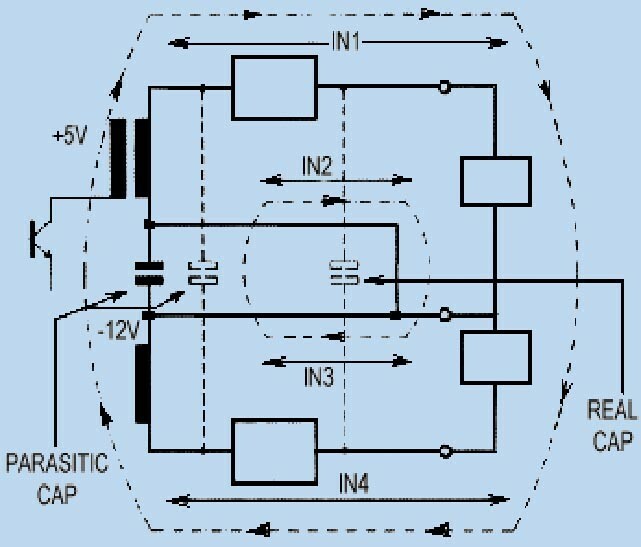 - high frequency components due to the harmonics generated in the switching process. The ripple can be fixed with a proper choice of the components during the design stage and its amplitude varies with their characteristic tolerance. The high frequency noise ranges over the radio frequency spectrum (typically up to 400-500 MHz for switching power supplies), and it spreads out in the conducted and radiated form. It is generated by the fast changing currents in coils, transformers and active components (transistors and diodes). Its amplitude depends on the parasitic parameters of the circuit (ESR of smoothing capacitors, stray capacitances and parasitic inductances). High frequency currents are transferred directly to the input, or to all outputs through the stray capacitance of the isolation transformer. More, the noise finds another path through the capacitance between the tab of switching components and the heatsink, flowing in a not very predictable way in the ground connections and mechanical enclosure. A first reduction can be obtained by connecting ceramic capacitors at the outputs (e.g. 100nF) and decoupling the PSU as much as possible from the equipment supplied. It is very important to keep any connections as short as possible. The noise in the ground is much more difficult to attenuate because of its higher frequency content, where the influence of parasitic elements is more significant and even a short PCB trace shows its impedance. Besides the several filtering techniques, the best practice is to take care of PCB layout and ground connection with mechanical chassis. Accurate measurement of these components requires very expensive equipment. A reasonable evaluation can be obtained with an oscilloscope with 50MHz bandwidth and a probe with a very short ground connection. For RFI it is necessary to use specialized laboratories. 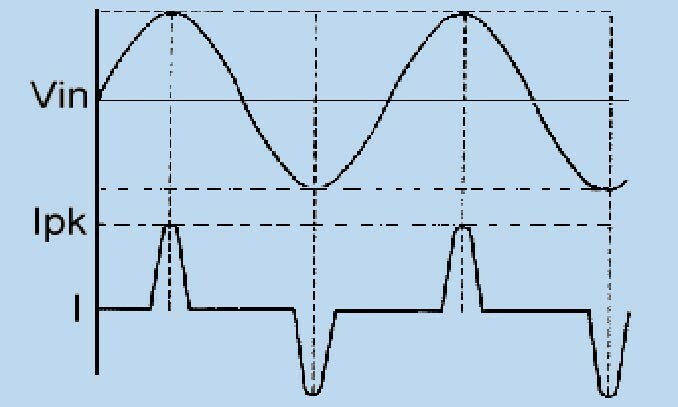 Ripple [mV] is defined as the periodic AC noise component of the output voltage measured with the following method (band limitation of 1MHz at nominal input voltage and nominal output current (Iout)). 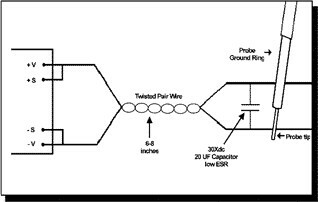 Attach a 6 to 8 inch twisted pair wire to the outputs of the power supply and place a 10-20 uF tantalum capacitor (low ESR type, with an appropriate voltage rating) across the load. 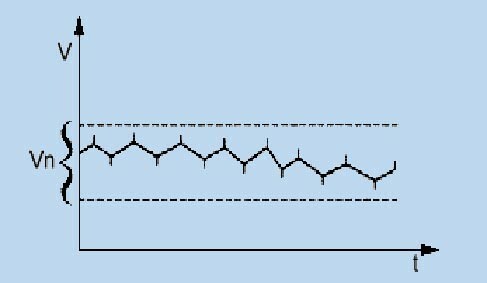 This test method is shown on the following figure. This test method will enable a remote measurement and eliminate any noise that may couple on to the extended leads coming off the converter. High power units are provided with remote sensing inputs in order to compensate for the voltage drop due to the connections between PSU and load. The current flowing through the sensing wires is very small. It is then advisable to twist them in order to reduce the picked up noise. In case where very slow changes in the load occur, the sense lines can be connected at the loads to compensate the voltage drop due to line impedance. In noisy environments or with long sense lines (1m<L<5m) it is recommended to use shielded cables to protect the sense signals from external noise. Although DC and low frequency performance is improved by remote sensing, over/under-compensation associated with long load and sense leads can affect the stability of the feedback loop seriously enough to cause oscillation and internal damage. Outputs witch regulation depends on the main output. Two or more units can be connected in parallel or series in order to increase the output current or voltage. With the parallel connection, the output voltages have to be adjusted to be as close as possible to each other. A difference will always exist so that the unit with the highest output voltage will supply all the current until its overload protection is activated, lowering its output voltage. The next highest output will start operating and so on. In order to avoid this behaviour, some models are provided with an input called Balance which guarantees a correct load sharing. Parallel connection affects also the dynamic performance and the output noise. Continuous operation sometimes requires a parallel-redundant connection. In this case a decoupling diode is used (option DD), connected in series with each output. Each unit must be able to supply the full power to the load, in order to guarantee proper operation in case of failure of the other units. In a series connection it is important that the overall voltage does not exceed the output to ground isolation voltage (usually 500V). It is also advisable not to use units with foldback protection because this could cause improper operation at power-up or during overload conditions. It is expressed as %/°C and indicates the output voltage change due to temperature change, for constant input voltage and load. Time taken from the output voltage to reach a value within the specification limits, after applying a load step (usually a transient between 10 and 100% of nominal load). Nominal voltage of the output. Adjustable voltage range. The output voltage may be adjusted within +/-10% of Vout by means of the internal potentiometer.